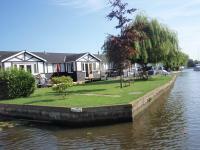 We offer self-catering riverside cottages on the Norfolk Broads, most of which are accessible for use by people in wheelchairs. Our cottages sleep from four to nine people and each has a fully fitted kitchen, bathroom including wheel-in shower, as well as full waterside access for fishing, bird-watching or boarding boats. All units have free Wi-Fi. A self-drive 21 foot wheelchair accessible electric dayboat is available for hire from the base at Horning by the day. The boat, which seats up to ten people including two people using wheelchairs, may be accessed by an electric platform lift which will lower and lift wheelchair users safely in and out of the boat. There is a toilet on board, and an all-weather cover if needed. For information on costs, availability and for booking details please contact us or visit our website. We have a selection of equipment free to loan when you holiday with us, please ask for details.